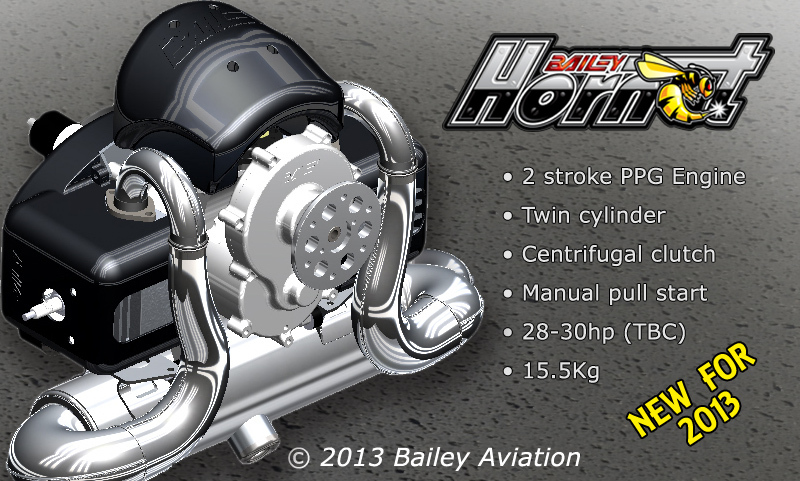 Since the beginning of the year Bailey Aviation have been designing and developing a new PPG 2 stroke engine, known as the Hornet. The Hornet has been designed due to many customer requests for an ‘Ultimate’ 2 stroke engine that is powerful, lightweight and reliable. The engine is a twin cylinder design that is very compact and lightweight. It will fit in the ‘higher power’ end of the market and be primarily aimed at slalom competition flying. Utilising a helical gear reduction system, centrifugal clutch and manual pull start arrangement, power output is around 28-30hp (TBC) and all up weight is around 15.5kg. After 12 years of producing machines with anodised aluminium fuel tanks we have finally bowed to commercial pressure and changed to a plastic tank. The Aluminium tanks though very beautiful (and somewhat of a Bailey Trademark) were becoming too time consuming and expensive to produce. Changing to plastic does have it advantages though, it is slightly lighter, easier to produce in complex 3D shapes and is of course translucent so fuel level can easily be seen. In Bailey tradition it is of course quick release and comes complete with a shoulder strap for those long walks to find fuel on bivouac trips. 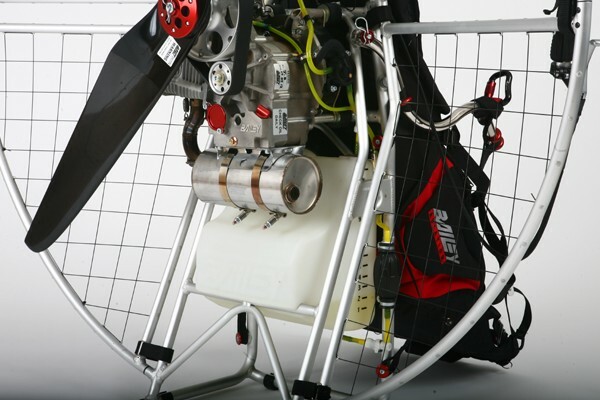 For the competition minded it is also mounted higher on the paramotor chassis and provides a clear airflow path under the seat and into the prop arc. Overal CofG is also higher, giving a lighter feel to the machine. Capacity is slightly larger than the standard aluminium tank at 11.5 litres. This new plastic tank replaces the 10L and 15L options.